Cut the kale in small pieces and wash. Transfer to a large salad bowl, pat with a paper towel to dry, and season with salt and pepper. Mix well and set aside. Steam the Brussels sprouts until cooked but still slightly crunchy and bright green. Transfer to a bowl. Drain the beans and rinse them well to remove any canned taste. Heat the oil in a large saucepan, over medium heat. Add the garlic and sauté until it starts to become golden. Add the Brussels sprouts and beans, and stir for an extra 30 seconds. Mix the lemon juice and balsamic vinegar in a cup, and pour over the kale. Mix well. Add the sautéed vegetables and shaved Parmesan cheese to the kale, mix well, and serve. You can replace the red kale in this recipe with any other kind of kale. If you want, you can sauté the kale together with the other veggies, and serve this as an accompaniment to any other dish. I love this stir-fry with mashed potatoes on the side, and a veggie burger. Store the kale in a closed plastic bag in the fridge. This way, it will remain crunchy for longer. I'm the kind of person who is cold most of the time, and in the winter months I need several daily doses of soups, teas, and spices in my food to heat up my body. Even though I'm a vegetarian, and I love eating many portions of fruits and veggies every day, this becomes a bit challenging when the temperature starts to drop. If I keep eating large amounts of salads and green juices during this time of the year, my hands, feet and nose become permanently freezing cold, and all I feel like doing is crawling under the covers. Luckily, there are many ways to keep eating all the things I like, and that are good for me, that also help me feel great instead of turning me into Frosty The Snowman. One of my tricks is creating all kinds of warm salads with seasonal vegetables and filling ingredients. 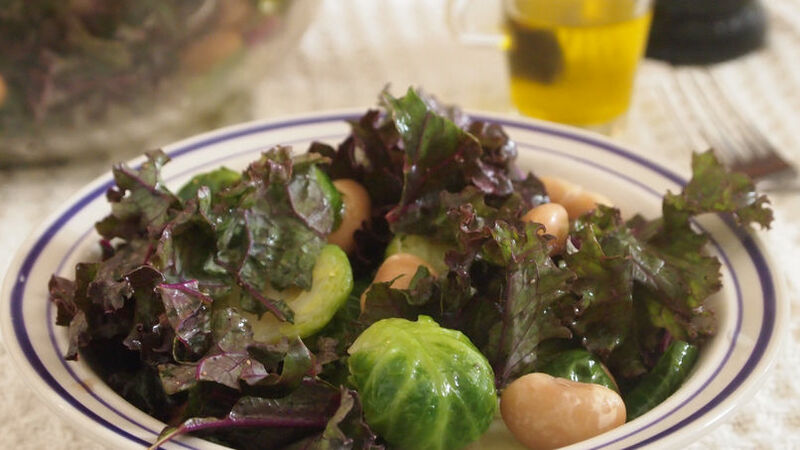 This kale, Brussels sprouts and butter bean dish is one of my favorite examples. Eating seasonal ingredients is important because they give your body what it needs at any given moment of the year. If your body needs to stay warm, eating winter vegetables will achieve this. Have this salad as an appetizer, as a light dinner or as side dish. I love to enjoy it next to a warm cup of homemade vegetable soup or cream. The key is to warm yourself from the inside out, with the help of the food you eat. Don't you love this concept? I do, and it works wonders for me.